Join the rewards club that gives you more! Coeur Rewards Club members can redeem points for Extra Play Cash, merchandise, hotel stays, meals, golf games, gas, spa services and more. The more you play, the more points you earn. Joining is free and easy. Plus, members get $10 Extra Play Cash just for signing up! Visit our Coeur Rewards Club desk to sign up and start getting rewarded today! Check Out What’s Happening at Coeur d'Alene Casino Resort Hotel this Month! Receive 10-20 cents off per gallon of gas from our Conoco gas station depending on card tier. Access to the Young at Heart program benefits (for ages 55+). 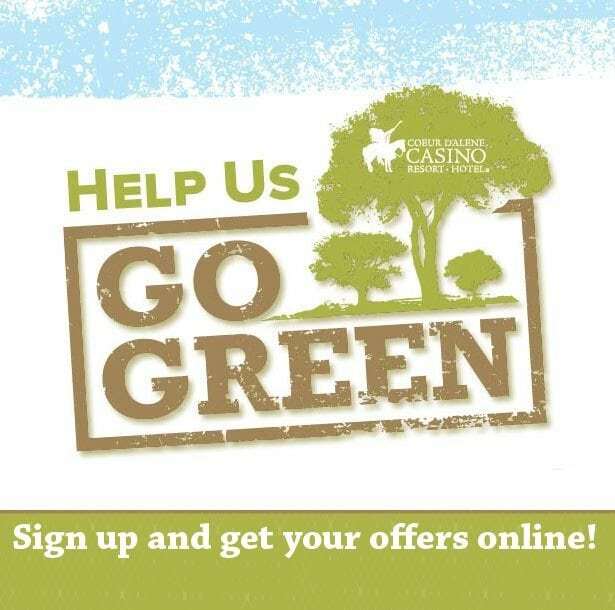 Based on play, receive special offers such as free Extra Play Cash, Hotel Stays, Food Offers, and more. Receive a gift on your birthday date and participate in that month’s birthday party drawings. Participate in monthly gaming promotions. Check out our Coeur Rewards Club online catalog shopping. Use the link below to see a full list of name-brand merchandise available or to track your order. Place your order at the Coeur Rewards booth during regular hours of operation. Items are mailed directly to the shipping address of your choice. If you are a current Rewards member, login and sign up to go paperless today! You’ll have access to your monthly mailer promotions and offers. Plus, you’ll be able to view different offers and your points online at any time. See the Coeur Rewards booth for full details. Signing up for the online benefits will result in no longer receiving paper mail.